This Chrome Experiment is an attractor based fractal generator, an interesting way of witnessing the chaos game in action. Created using create-react-app, which enables you to create React apps with no build configuration and works on macOS, Windows, and Linux. 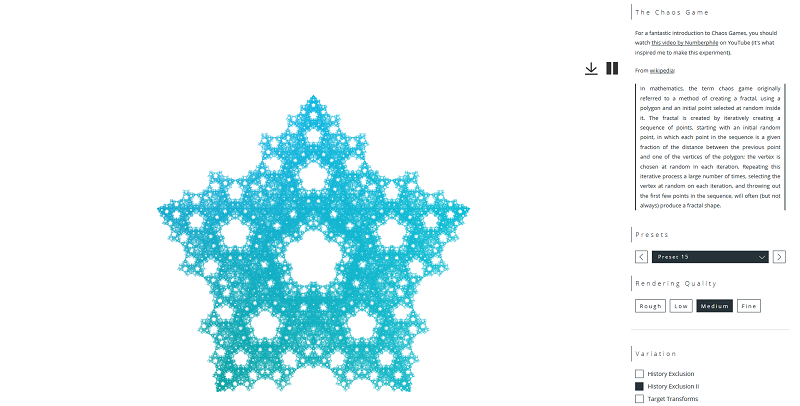 In math, the term chaos game originally referred to a method of creating a fractal using a polygon and a starting point selected at random inside it. This is done by successively creating a series of points. Each point in the series is a (specified) fraction of the distance between the previous point and one of the vertices of the polygon. You can see this in action or learn more about all of this here.